Our model portfolio remains defensively positioned 20% equities / 50% bonds / 20% gold / 10% cash ahead of what we expect to be an increasingly volatile second half to 2014. We are still tracking ahead of benchmark this year despite a more conservative portfolio and are on track to maintain our double digit annual return since inception. We are also excited to launch Delta Futures this month, an actively traded investment approach using multiple asset classes across multiple time frames. Delta Futures has returned +33% since launch on 1st January 2014. Please get in touch for more information on how to implement our Active Asset Allocator or Delta Futures investment strategies. All markets move in cycles. Bull markets spend the majority of their time advancing, interspersed with periods of consolidation and/or correction. Bear markets do the opposite, spending the majority of their time declining, with strong counter-trend rallies separating each move lower. Analysing market cycles helps to set the framework for making informed investment decisions. Examining 50 years of stock market data shows us that the average equity market Investor Cycle lasts 22 weeks. In a healthy bull market, we should therefore expect 15-18 weeks of solidly rising stock prices, followed by a period of consolidation or correction. The strongest bull markets tend to give back the least during their consolidations. We are now on week 18 of the current equity market Investor cycle, so history tells us that we should be on watch for a move down into an Investor cycle low. Investor cycle lows are often strong selling events, so this is why we continue to advise caution in the short-term. We are also on Year Six of this powerful bull market in stocks. A study of market history also tells us that equity bull markets have tended to last 3.8 years on average. So, the current bull market in stocks is getting long in the tooth. This is one of the key reasons we are also cautious in our medium-term outlook for stocks. Let's examine some charts to see if our cautious outlook is justified. At first glance, this equity bull market looks remarkably resilient, still favouring those with a bullish bias. The major US large-cap indices are making new highs each week and selling pressure is non-existent. However, if you look a little closer, you will see some initial signs of weakness, though they are only initial signs at present. Smaller cap stocks for example, measured by the Russell 2000 Index, are struggling to keep up with the S&P 500. While the S&P 500 is hitting new all-time highs, the Russell 2000 is -7% off its own recent peak. The small cap sector is considered riskier than its large cap counterpart and small cap stocks typically tend to lead the market, higher and lower. 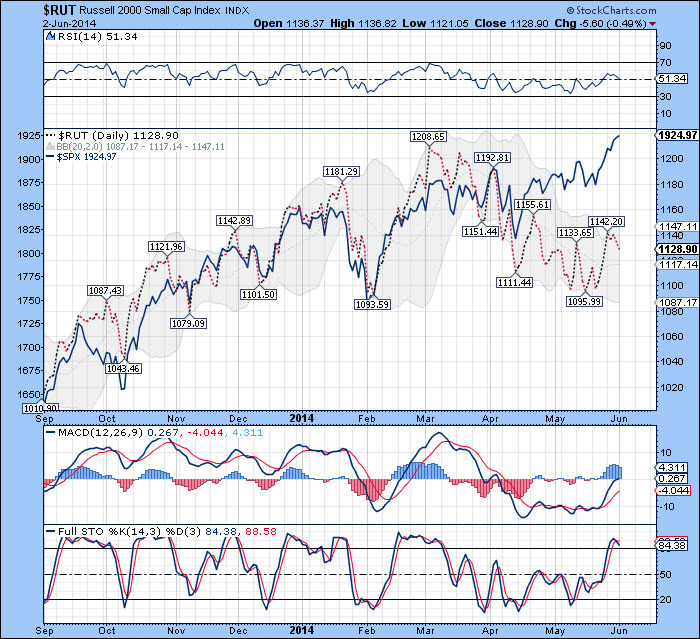 So, perhaps the Russell 2000 is signalling that the current trend is beginning to weaken. The stock market's underlying technical strength has also been truly impressive. A majority of the the 3,000+ stocks that trade on the NYSE have been in steadily rising uptrends for the majority of this cyclical bull market, as can be seen in the Advance/Decline Line below for the total market. This total market A/D Line is a key input into our technical trend indicator, which drives the asset allocation decisions we make. 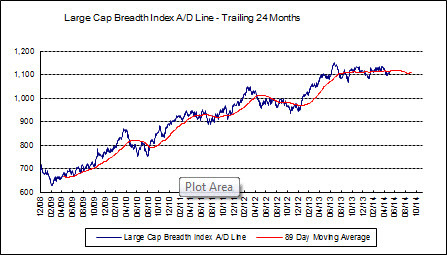 Now, if you look closely at these charts, you will see that, while the total market A/D Line remains in a steadily rising uptrend, the Large Cap Breadth Index A/D Line has flattened out. This means that the largest stocks in the index are no longer driving the stock market higher. This could change in a few months time, which would be a bullish development and cause us to move back to a fully invested position, but for now, caution is advised. It is the same story for the Most Active Stocks Index A/D Line, which has stalled despite the price indices hitting new highs recently. Stocks that are attracting the greatest daily volume are no longer leading the market higher. The stock market is looking tired. 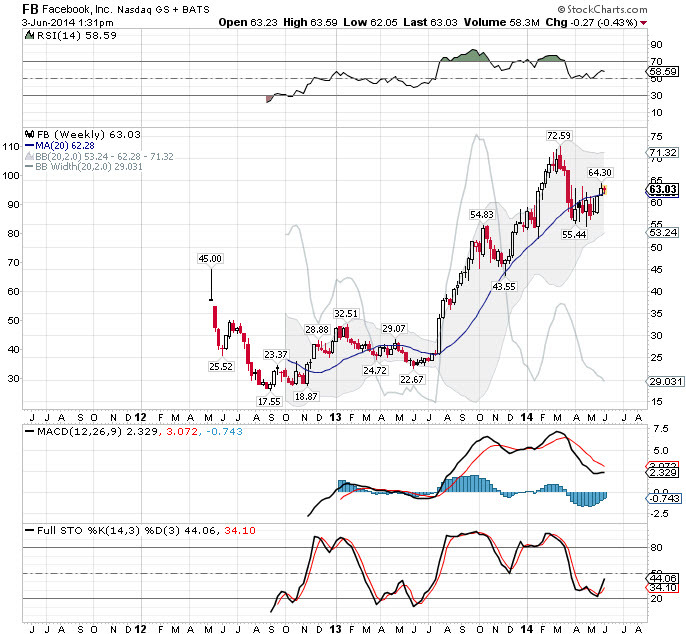 Many of the stocks that have been leading the market higher until recently are in the social media and biotech sectors and some have taken a drubbing in recent weeks, another sign that the character of this market is changing. Tesla (TSLA) plunged -33% in March 2014. Facebook (-24%), Netflix (-35%) and Twitter (-61%) have also experienced very sharp corrections recently. In our April 2014 Investor Letter we noted that a record number of unprofitable IPO's were coming to market and only in 2000 did we see a greater number of money-losing businesses taken public. The door appears to be closing now if the recent price action of the above stocks is anything to go by. We are also concerned about the recent turn lower in margin debt (money borrowed to buy stocks on margin). History has not proven very kind to investors when margin debt peaked in the past (1987, 2000 and 2007) and began to unwind as investors headed for the exit. Finally, if the US dollar is emerging from a 3-year cycle low, which is looking more likely each day as time passes, then it could put the breaks on this strongly trending US equity market. The US dollar index is made up of a basket of currencies, with the Euro having the biggest influence on the direction of the USD at 55% (followed by the Japanese Yen at 15%). 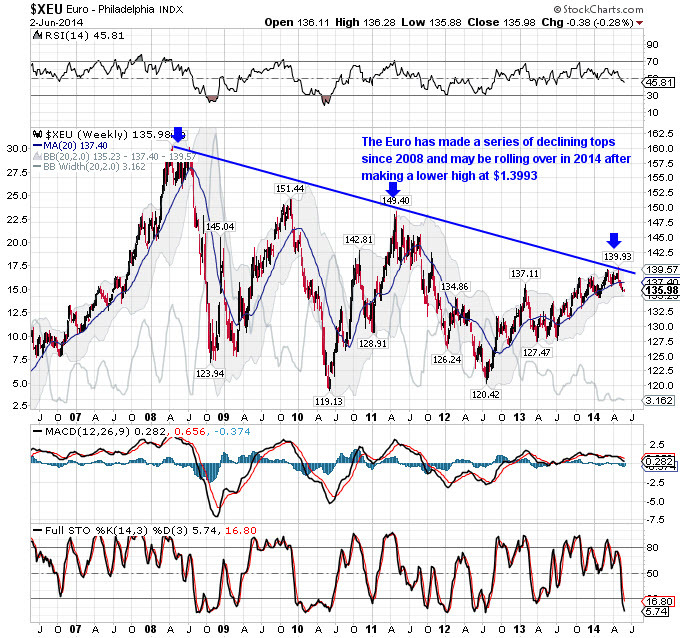 Over much of the last 12 months, a rising Euro has coincided with a falling USD and a sharply rising US equity market. Since May 2014 however, the trend has started to turn. The ECB meets later this week and Mario Draghi will likely attempt to talk down his currency again in an effort to stave off the growing deflationary threat across the Euro zone. We An additional interest rate cut will likely send the Euro lower versus the USD. To learn more about the full range of investment services available at Secure Investments, please contact Brian Delaney at 086 821 5911 or by email at brian.delaney@secureinvest.ie.